Monochrome styling is an instant way to add a luxurious feel to your space and what better way to create this on trend look in your own home than with the Bianco Black and White Coffee Table. 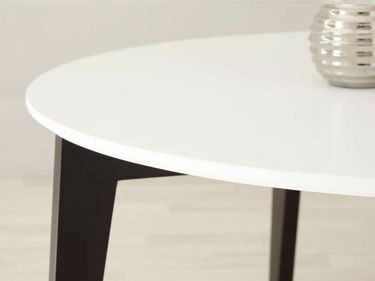 This modern coffee table has four angled legs supporting its smooth white satin round table top. The table surface adds a light, tactile sheen which contrasts beautifully with the black satin base. The Bianco Black and White Coffee Table measures 42cm in height and 90cm in diameter. This considered sizing makes the Bianco ideal in your living room or by your seating area, as the round top allows for ease of movement around the table without taking up too much of your space. Round table tops also create such a warm and convivial feel in a space, making the Bianco a perfect fit if your living area is the social hub of your home. The round table top of the Bianco is finished in a white satin while the legs are finished in a black matt satin. The contrast between the black and the white gives this coffee table such a strong yet relaxed look; a sleek take on monochrome styling. 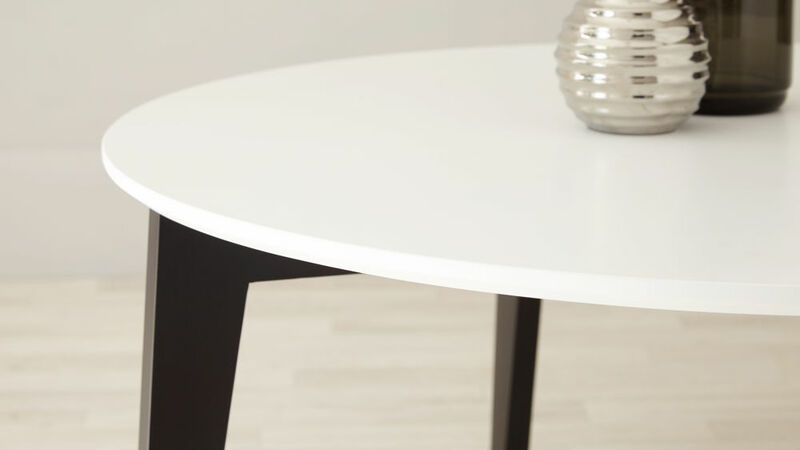 The table top and legs of the Bianco also have chamfered edges. This subtle detailing gives the table a much softer look while also making it that bit safer around younger children. There is no wood grain on the table legs or table top; both are fully matt. This gives this modern coffee table such a smooth yet tactile finish. Cool, clean and contemporary, the Bianco Black and White Coffee Table will soon become a staple feature in your living room interior. If you'd like to coordinate and extend the sleek monochrome look throughout your space, we suggest taking a look at our matching Bianco Black and White Nest of Tables. Grey has been an on trend colour for some time now and we’ve always been a big fan of this gorgeous shade here at Danetti. However, an old favourite seems to be making a comeback and it’s set to be bigger than ever! Monochrome styling has always been an instant way to add a clean and cool look to any interior. 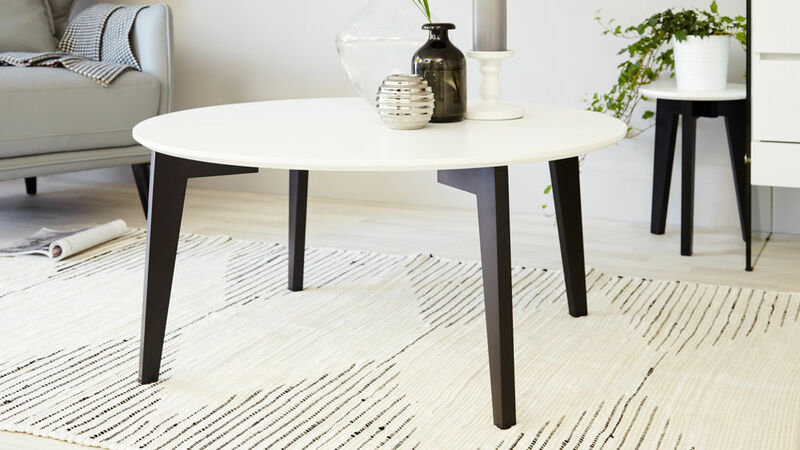 It can be quite a statement look, so the great thing about the Bianco Black and White Coffee Table is that you can add this sleek designer feature to your space but in a slightly more subtle way. It also creates ample styling opportunities for you to coordinate the table with other pieces throughout the space.